The spectre of a follow-on looms large over Australia in the Sydney Test. They are still 386 runs behind India with only four wickets in hand at the end of the third day's play, and it is extremely unlikely that they will be able to avoid the follow-on. In such a scenario, Captain Kohli will have to make a decision regarding whether to enforce the follow-on or not. He will have to take into account several factors before arriving at a decision. In the previous Test, he had decided not to enforce the follow-on even when Australia were bundled out for a paltry first innings total and had handed India a near 300-run lead. With the threat of rain on day five, that decision could have backfired. Fortunately for him and India, the rain relented after the first session was washed out and they managed to eke out the remaining two wickets to retain the Border-Gavaskar trophy. However, the weather forecast for the next two days in Sydney predicts clear weather. What’s more, an attempt will be made to compensate for the sixteen overs lost today due to bad light. The match is scheduled to start half an hour early on day four. There is a good chance that we will get almost 100 overs on day four and a minimum of 90 overs on day five. So, there is still a lot of time left in this Test, and despite the position that India enjoy now, things can take an ugly turn if a tactical blunder is made. That may seem quite unlikely, but stranger things have happened in cricket. India entered this match with four bowlers and have already bowled more than 83 overs. Though the two spinners have shared much of that burden, they too can feel fatigued if they are asked to bowl a second time immediately after a heavy workload in the first innings. Also, unlike the Indian lower order, their Australian counterparts are handy with the bat. As Sunil Gavaskar cheekily pointed out in his analysis of the third day’s play, Pat Cummins, Australia’s ‘best batsman’ on current form, is still at the crease! 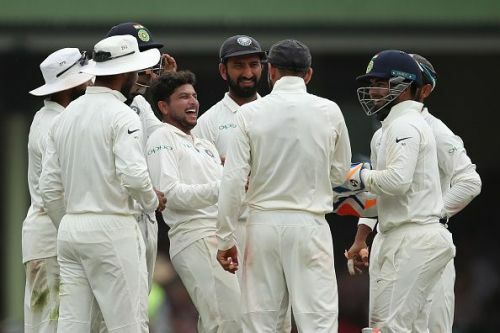 Kuldeep and co. have already bowled more than 83 overs in Australia's first innings. With Peter Handscomb for company and Mitchell Starc and Nathan Lyon to follow, the Australian tail can certainly wag and take the total closer to India's, even possibly avoiding the follow-on all-together. Even if the Australian tail is blown out quickly on the fourth day, it will still be prudent for India to bat again as the pitch is still quite good to bat on. 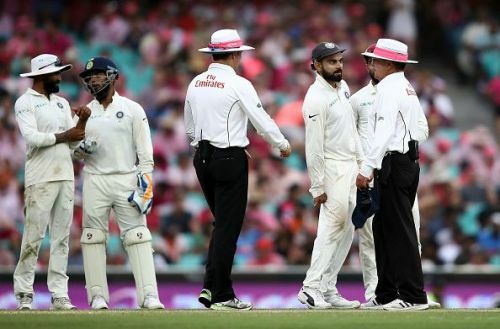 If the Australian batsmen manage to show resilience and bat purposefully, it will tire out the Indian bowlers who might end up on the field for more than two days. There is then a possibility of India actually chasing a target in the fourth innings on a crumbling fifth-day pitch. The target may be pretty small and there may be just over a session or two to bat. But with history in sight, there is the possibility of the Indian batsmen succumbing to pressure. To avoid that sort of scenario and to completely put this match out of Australia’s reach, India must bat again even if Australia fails to avoid the follow-on.